This true story is unique in English: the personal account of a Canadian man conscripted into the Red Army, facing the of the biggest invasion in the history of warfare. 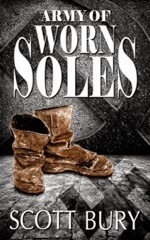 Army of Worn Soles launches June 22 on Amazon. Visit the author’s blog, Written Words, for more info and to pre-order. This entry was posted in Uncategorized and tagged army, human compassion, Novel, pow, war, World War Two on June 11, 2014 by Dana Griffin. I’m reading the ARC. Well written and moving, especially knowing that the book is based on the true story of Scott Bury’s father, Maurice. I probably read the same arc, Elise. I too am looking forward to reading this book. Thank you for stopping by.